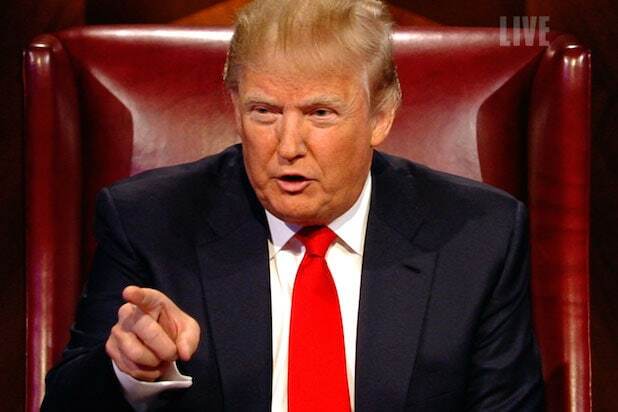 Donald Trump's freewheeling style caused headaches even before he got to the White House, as a staffer on "The Apprentice" had to "reverse engineer" episodes of the NBC reality series because he would "fire" contestants at random. In a long profile on Mark Burnett and Trump in The New Yorker, published on Thursday, Jonathan Brown – an editor during the first six seasons of "The Apprentice" – Trumps would often decide on a whim, which contestant to "fire" at the end of each episode. That meant that, even if the "fired" contestant had objectively had a good performance in the Browning the magazine. This deceptive editing, which happens to be a reality drama, extended past Trump's decision on who to send home. Katherine Walker, a producer on the show, told the New Yorkers that they often had to edit his speech to make him sound more coherent. "We cleaned it up so that he was his best self," she said. "I'm sure Donald thinks that he never edited." She did admit that Trump's personality made him perfect for reality. Brown added that he now sees this same sort of editing in reverse storytelling among those who work for the now-president Trump. For each successful and groundbreaking reality television show ("The Bachelor", "Survivor"), there have been a few dozens of short-lived and long-forgotten imitators, some of which were truly bizarre. And not always in a good way. "The Bachelor," Fox debuted "Joe Millionaire" just one year later, pitting contestants against each other for the affections of an average Joe whom they believed to be rich. Long Before Logo's "Finding Prince Charming," Bravo had it's own gay "Bachelor." Except "Boy Meets Boy" had a cruel twist. Clearly attempting to capitalize on the success of "Temptation Island," Fox's "Paradise Hotel" put a group of singles together in a resort, pairing them off each week. [Personality Fox] "=" image -loading "
With Monica Lewinsky serving as host, Fox's dating show "Mr. Personality" is weird. NBC's take on the dating competition show has a bunch of shouts compete for the heart of a beautiful woman. The twist was that at the end of the season, she was then given the option to choose between her average-looking suitor and a more conventionally attractive man. "Forever Eden" shared many similarities to its predecessor "Paradise Hotel," with the exception of the show's premise for contestants to stay in "Eden" for years at a time. Each week, Fox's "The Swan" took two women and gave them complete surgical makeovers, claiming to be an attempt to better their lives. After the 2004 election, documentary filmmaker R.J. Cutler parodies the entire political process with the Showtime competition show "American Candidate." The Idea of ​​a Reality TV Show Producing a Viable Political Candidate Served as Satire in 2004, but seems remarkably prescient in 2017. One of the most exploitative shows on television history, "Who's Your Daddy?" made a game out of a woman trying to find her real father. Perhaps the strangest of Bravo's professional competitions was "Shear Genius," which had to compete with each other to see the best haircuts. "The Devil Wears Prada" is an excellent movie, but no thought of it Miranda Priestly treated her assistants is something that should be emulated. No one except someone in The CW's unscripted department, that is. The network turned the entire concept into a game show, with a bunch of 20-somethings debuting themselves for an entry-level job at Elle magazine. VH1's "Scream Queens" sought to single out with screaming, stunt killings, staring for their lives and pretending to be possessed by the devil Hollywood's next big horror movie star. Season 1 champ Tanedra Howard won a role in "Saw VI" for her efforts. Much like the now-rebooted "Fear Factor," The CW's "13: Fear Is Real" basically tortured its contestants by leveraging their darkest fears. Players were buried alive, covered in councils, put through a trash compactor and left alone in the woods at night, with the lucky winner taking home a measly $ 66,666. MTV's "The Phone" was a neat concept, throwing unsuspecting contestants into action movie plots, complete with conspiracies, exploding cars and shady phone calls. Like many entries on this list, "Skating With the Stars" What an attempt to capitalize on another, more successful show. In this case, it's ABC's "Dancing With the Stars." Years after "The Swan" was panned for its shallow interpretation of beauty, E! presented it's own take on the plastic surgery makeover show. "Bridalplasty" took on the competition format of "Big Brother" and made it up with the head-to-toe plastic surgery of "Extreme Makeover," resulting in one of the most widely panned shows of the decade. ABC put 14 contestants into a house, and let America win $ 250,000. CBS claims the show is a ripoff of "Big Brother," "The Glass House" lasted just one season. Based on a Dutch format, "Splash" had 10 celebrities compete in a professional diving competition, coached by Greg Louganis. With low ratings, and more than a few unfortunate injuries, the show was canceled after just one season. It also did not help the show aired just months after the Fox special "Stars in Danger: The High Dive,"
Not every show can be "Survivor"
For every successful and groundbreaking reality television show ("The Bachelor", "Survivor"), there have been a few dozens of short-lived and long-forgotten imitators, some of which were truly bizarre. And not always in a good way.